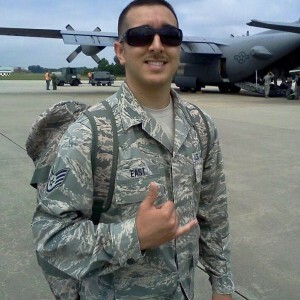 Air Force Reservist Staff Sgt. Joseph East works as a contract specialist with 409th Contracting Support Brigade in Grafenwoehr, Germany, and will be featured in the movie “The 5th Wave,” due in theaters Jan. 2016. 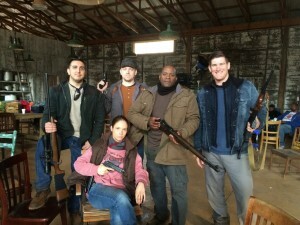 GRAFENWOEHR, Germany — Joe East, a contract specialist with the Regional Contracting Office Bavaria, recently had the opportunity to flex his acting muscles for an upcoming movie. East was selected for a featured role in the movie “The 5th Wave,” which hits theaters across the world Jan. 22. East, who is from Hawaii, is currently living in Grafenwoehr, Germany, working for both the Army and the Air Force. He is a contract specialist for the 409th Contracting Support Brigade’s RCO-Bavaria and is also an Air Force Reservist. “I am a staff sergeant in the 94th Civil Engineer Squadron at Dobbins Air Reserve Base, Georgia, and I am a contract specialist in the 409th Contracting Support Brigade. Not too many people can say that they work for both the Army and the Air Force at the same time, and I’m proud to serve in both,” said East. Prior to moving to Germany, East resided in Georgia and was selected for a featured role in the upcoming movie, “The 5th Wave.” The movie is based off of Rick Yancey’s book, “The 5th Wave,” which was a New York Times best seller for 21 weeks in a row and is sold in more than 30 countries. East, on the left, on the movie set of “The 5th Wave,” in which he plays a mercenary in Hutchfield’s Gang. “In the movie, I play a mercenary with actor Terry Serpico. Many people recognize Terry Serpico as Colonel Frank Sherwood in the TV show ‘Army Wives.’ However, in ‘The 5th Wave,’ he plays Hutchfield,” said East. This movie offer was not the only one East received. “After filming ‘The 5th Wave,’ I was also selected for a role on ‘Insurgent,’ the ‘Divergent’ sequel, but I ended up turning the role down to come to Germany,” said East. East’s love for acting started in high school. “During high school, my favorite class was television production. We actually had a studio where we broadcasted the school news live every morning and every class room had a television. Each morning we would take turns being the news anchor, camera man, and producer,” said East. East remarks that his military training helped him land the offers for both films. “My combat and physical fitness training in the military helped me land the role on ‘The 5th Wave’ and also helped me get offered the role on ‘Insurgent,’ ” said East.